Latin Percussioon offers this cajon bag, measuring 12" wide and 19" tall to comfortably hold most cajons. Tailored for durability and long life--and for your budget, these cajon bags are constructed from durable black nylon. The LP Cajon Bag also features a zippered side compartment and convenient carry strap which allows players to tote their cajons easily. A cajon may be primitive--basically a resonating box on which the player sits and plays with bare hands conga-like--but it deserves better than being tossed unprotected into the trunk of a car or plane. And when you consider the resonance and finesse LP designers build into each cajon, the notion of a carrying case is particularly relevant. The LP cajon is no humble box; it is an instrument with a surprising breadth of resonant frequencies. True, LP cajons are rugged, but nothing is going to stand up to repeated abuse such as the smack of a trunk lid! Given the tremendous surge of interest in the cajon and the many refinements LP engineers have crafted into their cajons, there is every reason to get out there and play one--and keep it safe in transit. 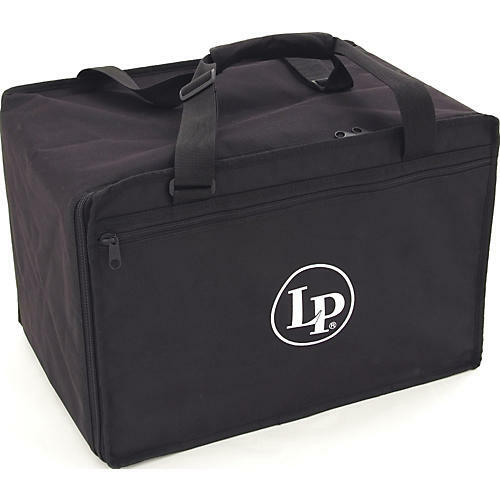 The new LP cajon bags makes plain good sense.